Job Tags (Keywords) are used to categorize jobs for the purpose of easy access. In Billing module, Tags can be used for easy reference of viewing invoiceable & invoiced jobs. This facility is available for Admin & Manager type users only. Step 1: Click on -> Click on option in “Tags” window. 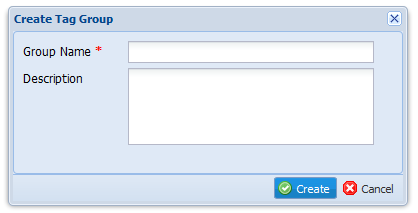 Step 2: Type < Group Name > and & < Description > (if needed) in below “Create Tag Group” window. Step 3: Click on button to add new tag group to your “Tags” window. This option is not available with default “General” tag group. 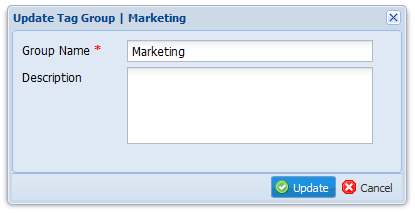 Step 1: Click on -> Click on “Update Group” icon in front of the tag group name you need to edit. Step 2: Edit necessary tag information in “Update Tag Group” window. Step 3: Click on button to save the modifications. Step 1: Click on -> Click on “Delete Group” icon in front of the tag group name you need to delete. Step 2: Click on “Yes” button to confirm the deletion in “Confirm” pop-up box. Step 1: Click on -> Click on option OR click on “Create Tag” icon near tag group name in “Tags” window. 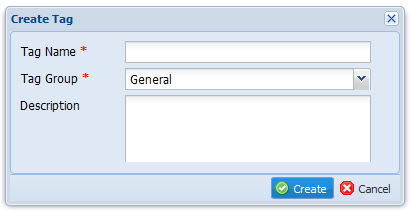 Step 2: Select < Tag Group > and type < Tag Name > & < Description > (if needed) in below “Create Tag” window. Step 3: Click on button to add new tag under selected tag group. Step 1: Click on -> Click on “Update Tag” icon in front of the tag name to edit tag. Step 2: Edit necessary tag information in “Update Tag” window. Step 1: Click on -> Click on “Delete Tag” icon in front of the tag name to delete tag. Step 2: Click on “Yes” button in “Confirm” pop-up box to verify the deletion OR click on “No” button cancel. Click on -> Click on “Tag Information” icon in front of the tag name OR tag group name to open “Tag Details” window. Click on -> Type [Tag Name] you need to find in option -> Click on magnifying icon to view search results.